Write the correct plural of woman. The woman is pushing the shopping cart. 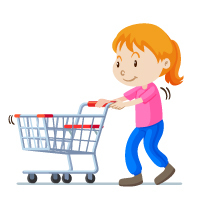 Will the shopping cart move toward the woman or away from the woman? Which word has the more negative connotation? That woman is a millionaire. What does the adjective clause modify? The woman whose briefcase you found is here to pick it up. The woman in the blue dress slept during the trip. A woman of Troy tries to warn the people about the statue.